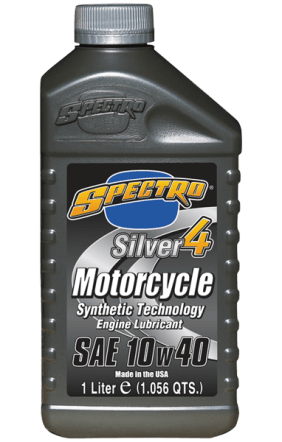 Spectro Silver 4 is formulated using Synthetic technology, high quality base stocks, special shear-stable polymers, and the most advanced detergent-dispersant-anti-wear additive package available. Keeps motorcycle crankcases clean, prolongs engine and transmission life, smoother shifting, reduced friction, increased horsepower, highest shear stability. Exceeds all known motorcycle manufacturer’s warranty requirements, plus A.P.I. SL/JASO MA/MA 2. Recommended for use in all 4-stroke engines.